Discover Our 2019 Summer Camp Opportunities in Sugar Hill! At Discovery Point Sugar Hill, we’re excited to be able to offer a fun, hands-on summer camp program for children in the Sugar Hill area. 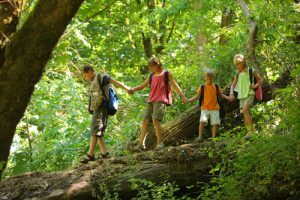 Since summer is a time for discovery and exploration, you can count on us to provide your child with plenty of opportunities for adventure as well as chances to build skills, make memories, and form lasting relationships. This year, our “Mighty Me!” program aims to help campers find the superhero within themselves by encouraging them to develop their strengths and celebrate their unique talents. By the time summer is over, your child will be ready to bring his or her “superpowers” back to the classroom. We’ve designed our summer camp program to incorporate ten weekly themes that draw inspiration from some of our favorite pieces of children’s literature. These literature-based themes provide context for our “mighty missions,” taking children on new adventures as they put lessons they’ve learned through reading into real-life action. As part of these mighty missions, we’ve included a variety of fun challenges, hands-on activities, and excursions to keep campers on their toes and excited about every new day at camp. Cooking projects that spark children’s imagination to build new recipes of their own. Science experiments to help campers understand phenomena in the natural world. Arts and crafts that allow children to become creators of their own inventions. Drama scenarios that encourage children to bring their imaginations to life. Challenging puzzle games to emphasize the importance of teamwork. Adventure-filled field trips to exciting places. Inspiring talks from our teachers and guest speakers. Physical challenges to boost children’s understanding of the mechanics of their bodies. The lessons behind our mighty missions propel children to learn how to use their superpowers for good. As campers participate in these engaging activities, they’ll gain a better understanding of important lessons regarding companionship, sportsmanship, self-esteem, kindness, respect, and other essential values. While they’re having fun, making friends, and creating memories, they’ll also come to the realization that becoming their own superhero means becoming the best versions of themselves. For more information about our summer camp in Sugar Hill, give us a call at (678) 482-8101 or stop by Discovery Point Sugar Hill today.